Crustless Gluten-Free Quiche--Nobody will miss the crust! 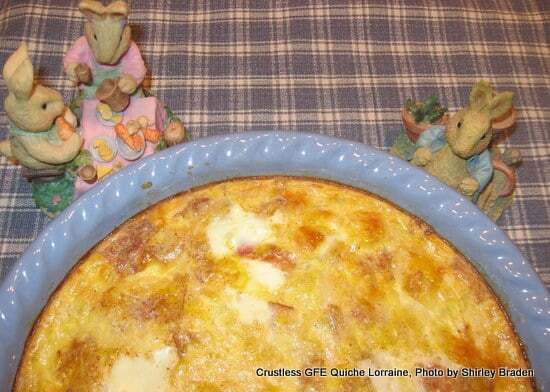 Today I’m sharing a recipe for Crustless Gluten-Free Quiche Lorraine. Quiche has always been a favorite of mine. One of the highlights of the holiday season for many years for my family was going Christmas shopping at a nearby mall. Lunch was always at O’Brienstein’s and my mom and I always had quiche. Diane, over at The WHOLE Gang, has initiated a new blog carnival called the Friday Foodie Fix. Each week features recipes with a secret ingredient. This week’s ingredient is eggs. This week seemed like a long one and I was out for several hours today enjoying art galleries and having lunch with my friend, Veronica, so I wasn’t sure I’d get to participate. But, I came home refreshed and re-energized. Oh, and I guess I should mention the exhibit at our first stop, LibertyTown Workshop, was “Feast For the Eyes—An Exhibit of Art … About Food.” So many glorious renderings of food can make a girl want to get busy in the kitchen! Then, when I saw the secret ingredient for the Friday Foodie Fix was eggs, I knew this would be a good time to share one of my favorite gfe recipes—the way I still get my quiche fix—Crustless Gluten-Free Quiche. I am sharing two versions. 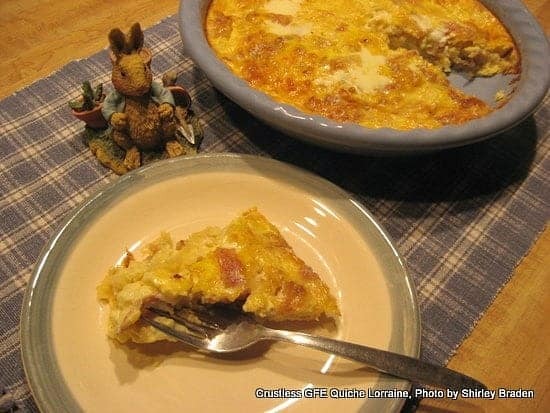 The quiche that I made this evening is a crustless classic quiche Lorraine, which calls for eggs, Swiss cheese, bacon, onions, milk, salt, and a small amount of flour. 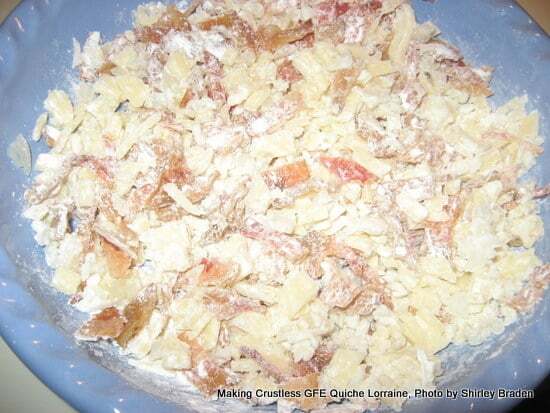 What makes it crustless and gfe? 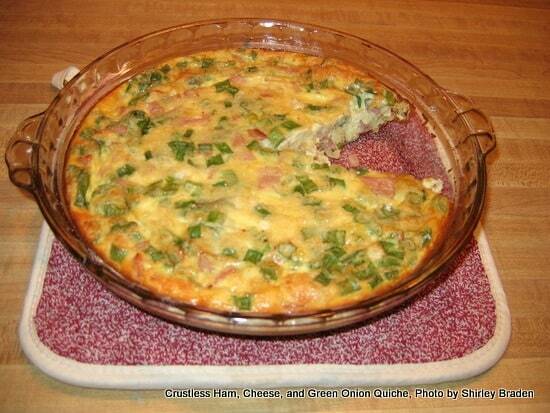 Not too long ago, I tried the gfe quiche variation using ham and green onion, versus bacon and yellow onion. It’s shown below. It was quite good also. Since then we’ve also added a little chopped green pepper to the ham quiche, but we prefer the quiche Lorraine. The main point is that quiche is a very adaptable recipe. You can use leftover bits of meat, seafood, and vegetables, but the eggs are key, of course. If you absolutely want some type of crust, consider alternatives like rice crusts and potato crusts. Be sure to check out my tutorial Build a Better Breakfast, Brunch, Lunch, or Dinner with Gluten-Free Quiche for many more ideas on fillings and crusts. Because I am trying to eat more dairy free these days, I won’t be making any more quiches for us for a long while. This evening I ate a small piece with a side salad. Quiche just seemed like the perfect way to meet the eggs requirement for the Friday Foodie Fix and to also introduce you all to this easy tip on making a quiche not just gf, but gfe. My friend, Sue, from a sister support group, shared the tip on adding ¼ cup of gluten-free flour for making pies and quiches. (I’ll be sharing lots of crustless dessert pie recipes in the future.) When I tried Sue’s tip, I truly felt like I had hit the gfe jackpot. Try it … I promise you, you won’t miss the crust! You won't believe how easy it is to turn your favorite quiche into a crustless gluten-free version! So delicious and super easy, too, since you don't have to worry about making a crust. Quiche Lorraine is a classic and my personal choice but there are lots of flavor options. Preheat oven to 350F degrees and grease a 9-inch pie pan. In a bowl or larger measuring cup, beat eggs together and then add remaining ingredients, beating well. Pour egg mixture over the bacon mixture. Bake, uncovered, for 35 to 40 minutes or until toothpick comes out clean. Let stand several minutes before cutting. For a grain-free option, use sifted coconut flour in place of the gluten-free flour mix. When making this recipe using ham, I like to add in a small amount of chopped bell pepper (usually green pepper). Adapted from a recipe from Leanne Ely of Saving Dinner. I actually received the original recipe years ages ago via email from Leanne Ely through Flylady. Leanne Ely is a cookbook author and promoter of healthy, reasonable meals. Her saving dinner site offers menu mailer subscriptions. The low-carb menu mailer can easily be adapted to gluten free—along the lines of gfe. I subscribed for a while and enjoyed the menus! Originally published April 10, 2009; updated November 23, 2018. You make everything look so delicious and easy to make. I love it. One of my favorite ingredients is bacon. I’ve long since stopped making quiche with flour but now I’m going to give it a try with my next one. Thank you so much for participating and sharing the information about my Friday Foodie Fix. I can’t wait to see what you create with avocados next week! Thanks so much! Yep, I’m all about easy. Trying to live up to my blog’s name! LOL Seriously, there’s never a need to spend hours in the kitchen to get a wonderful meal whether one is eating gluten free or not. 🙂 I’ll be looking forward to your quiche post when you get to make it again. Your first Friday Foodie Fix got a great response! It’s fun to see the variety of recipes and think about incorporating them for future meals. Eggs are a terrific ingredient, especially when they are the key ingredient, because usually that means the recipe can work for any meal–just like my quiche can. Am I right in thinking that you would like to host Go Ahead Honey one month? I have July Free at the moment if you would like to host that month. If you do, please let me know and we can discuss a theme. I love quiche. I make a crustless quiche that does not use flour, but I think I’ll try your recipe next time. Thanks! I am just catching up on your recent posts, everything looks just great. I love the cute little Easter bunnies around this quiche! I have Leanne Ely’s Saving Dinner the Low Carb Way, because as you mentioned, most are GF or can easily be made GF. There are some great recipes in it; unfortunately I do not use it much as my allergies have worsened over the years and I can’t do most meat products anymore. Oh well, someday! Hi there, CoconutGal–Thanks so much for taking the time to stop by and provide such nice comments. I’m doing pretty well, thanks. As I was telling Ali, I am not usually much for figurines (or “dust collectors” LOL), but I have a particular fondness for bunnies so these come out every year around Easter. They usually stay in a small cabinet, but I thought hey, why not use them in my food pics? 🙂 Glad you are enjoying them! Gluten and dairy have similar effects on folks. “The peptides from gluten and casein are important because they bind to opiate receptors in the brain, mimic the effects of opiate drugs like heroin and morphine and affect behavior.” For me the “behavior” issues are mood, brain fog, little mini trances (you know those times when you just get stuck in a stare/daze? ), etc. You can read more here in this brief article on the effects of wheat and dairy. My one friend says we are not baby cows and another blogger says why do we want to drink something that allows a calf to grow to be a full-grown cow in about a year. I’ve read that the reason folks don’t have as many issues with goat’s milk is because it’s far more simiilar to human milk. I also have other issues when I eat dairy that are more well known, like congestion, ear pain/pressure, and sinus headaches. Leanne Ely’s menu mailers can be really helpful to folks. There are some good recipes there and I like the fact that it’s an easy way to start learning substitutions on one’s own. We all need to learn to cook and figure out ingredient combinations on our own that are safe and work. But, no meat products is really tough. I truly hope you’ll continue healing so you’ll be at your best and eventually can re-introduce more foods! Hi, I just got here from The Pasta Queen and I’m very glad I did. You made that quiche look so good, I can’t imagine why it would ever need a crust. Your comment above to CoconutGal was so informative too – thank-you. I’ll be back! Hi, Cybill–Welcome! 🙂 Thanks very much–it is a great quiche and so easy. I also appreciate the feedback on my discussion with CoconutGal. Folks are skeptical when they hear that that type of info, but the data is out there. Individuals and parents of children with issues can share their own testimonials on getting themselves or their child back, respectively, after removing gluten and/or dairy. Thanks so much for commenting. Look forward to seeing you again! Just beautiful Shirley…a great way to save calories too! I have often made crustless quiche and crustless pumpkin pie to save calories. These look wonderful. I need to return to quiche baking to give my vegetarian Grrrl more options. Hey, V–Thanks so much! Ah, you’ve hit upon another favorite of mine—the crustless pumpkin pie! One need never make a crust again for pumpkin pie … all you get is pure delicious pumpkin taste. I’m so glad I stopped by. I found you via The Whole Gang and have just added you to my bloglist of GF bloggers. Your quiche looks fabulous. I would recommend, since you’re interested in experimenting with dairy free, that you veganize the quiche. It would be quite easy. One thing you could do is sub in tofu for the eggs, I think you’d have a winner. There are lots of vegan quiches in either vegan cookbooks or on the internet – give it a try. Much continued success. I look forward to reading your future blog posts! Mmm, I love quiche, and this recipe looks awesome =D. I just got a new pottery pie dish from an artist at the farmers market. Your quiche would be a great recipe for my first test drive! 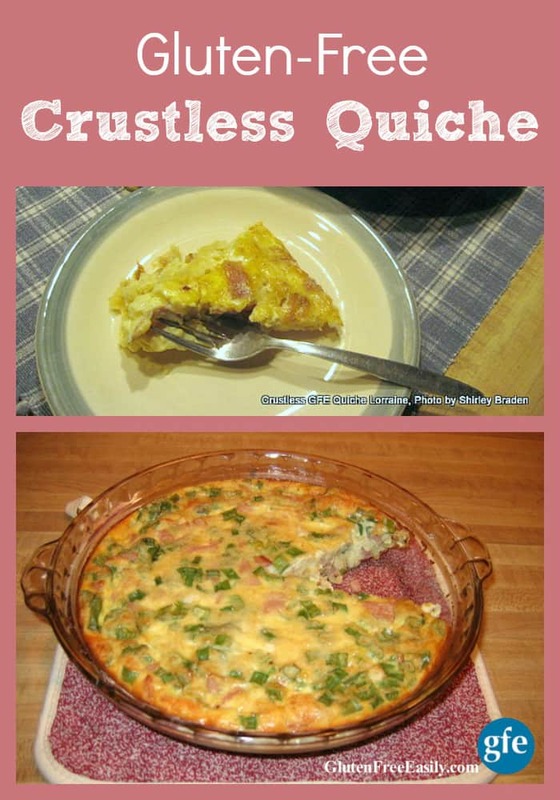 Shirley crustless quiche is one of my all time favorite quick go to meals when I need a little break from cooking. I love that we can throw in whatever we like! 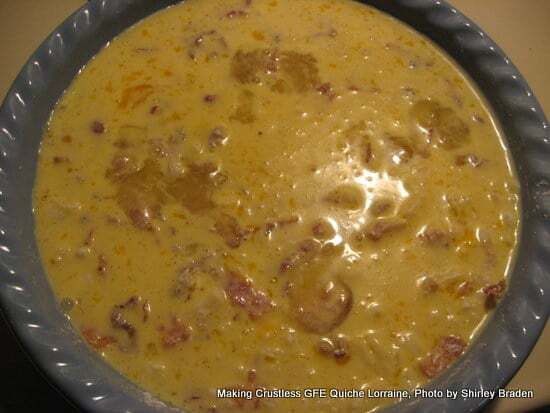 Shirley – you posted this before I found you – it’s a great recipe. You always come up with the most fabulous ways to make cooking GF easy – the perfect meal for anytime of day and no need to make crust. Thanks so much for sharing this at Slightly Indulgent Mondays! Hi, Amy!–Ah, you say the nicest things! I truly appreciate your words … if that is coming across, I’m being successful here at gfe, because that’s my mission to show folks that eating gf doesn’t have to be hard at all. 🙂 Eating gfe is a snap in many ways! Thanks for your support on Amy’s blog! Your quiche looks so good! Hi Iris–Welcome to gfe! I love your beautiful name; the name of your blog, The Daily Dietribe (so clever! ); and your story you shared about going gluten free resolving your depression. That is just so huge and I’m so happy that being gluten free has given you that new life! As I shared on Amy’s blog, Dr. Vikki Petersen has shared her findings on celiac.com about how much of depression can be resolved by going gluten free and why. That looks really good! I made my first quiche last weekend, we enjoyed it, even my husband liked it. Thanks for adding your recipe to the Sir Ham A Lot Leftover Party! I love quiche, although I haven’t made one in a long time. As a borderline diabetic, I’ve been quietly resolving to try to find more carb-free or lower carb dishes I can make, this sounds like something that would be so quick and easy to do, and without the crust would be just what I need! Thanks for sharing the recipe and technique. Hi Charlene–Welcome to gfe! 🙂 Crustless quiches are really great and, yes, so easy. I made one while on vacation with girlfriends the past few days. There were two small slices left and Son was so happy I brought those home for him. 😉 I hope you’ll enjoy this recipe when you give it a try. Would love to hear back from you if you get a moment! I like any type of onion in quiche, particularly paired with ham or bacon. You’re right, quiche is great fro throwing in whatever you have. Thanks for linking these up for the quiche challenge. Have always been daunted by the thought of trying to make my own quiche (or anything for which I can’t find a crock pot recipe that allows for dumping everthing in at once an walking away) but love quiche and on reading your recipe, I think I can finally give it a try. I’ve shared it on my Facebook page, mostly just to be able to keep track of it myself, but I know of a lot of ppl who will be looking it over with great excitement. Hi Flo–I may be too late. I’m sorry if I am … I’ve been away from the blog for a while due to some family concerns. You can always look through my Recipe Index or use my Google Search feature to find specific recipes. However, I’ve only got two cakes that have a coconut factor. One is my Banana Kahlua Coconut Cake and the other is my Pineapple Layer Cake with Maple Coconut Whipped Frosting. The latter is a mini cake, but it will still serve a few folks. Hope those links helps! I will LOVE this! Thank you! i used lactose free cheese and cashew milk as I can’t tolerate lactose. The cashew milk is bland and close enought to cows milk. I used a sweetened kind by forager. Zeuska–How did your quiche turn out with your substitutions? Good, I hope! What a lovely quiche, Shirley! Although I can eat gluten I am trying to eat less of it these days and gluten free quiche is perfect for the whole family! Thank you for sharing this post with us at the Hearth and Soul Hop. Sharing! Thank you also for sharing the new Friday Foodie Fix with us. Also love the sound of the “Feast For the Eyes—An Exhibit of Art … About Food.” !